In the last few weeks I’ve seen multiple people on Facebook claiming 2016 is the worst year in history. After I checked to make sure I wasn’t in an alternate timeline where events like the Black Death, the French Revolution, and World War II (among many others) never happened, I concluded they were probably exaggerating. Still, it seems like many people have started to believe the idea that overall welfare in the world is on a downward trend. Luckily, they couldn’t be more wrong. Let’s take a look at some of the main complaints about the world in 2016. Our World in Data is a great source to visualize these long run trends and is where I got most of the graphs below. Check it out if you’re interested in topics I didn’t cover here. If you listen to the media, you might be a little bit scared to go outside. Mass shootings, terrorist attacks, and police brutality seem to be perpetual components of the nightly news. I of course do not want to trivialize any of these problems. Any level of unnecessary violence above zero is something we should try to eliminate. But violence has always been a part of this world. Has it been getting worse? No. You might think that restricting the focus to gun homicides would show a different trend. 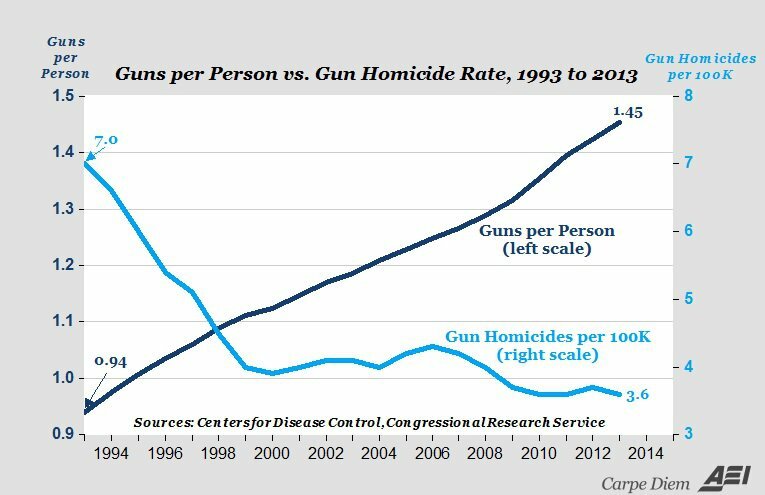 As Mark Perry explains, gun violence has actually fallen even as the number of guns has steadily increased. We still have a long way to go, but it looks like we’re on the right track. In the US, you have probably heard that income inequality is up, middle class incomes have stagnated, and the poverty rate hasn’t fallen in over thirty years. All of these statistics are true on the surface, But as Don Boudreaux likes to point out, being poor today is not the same as it was in the past. In another post, he notes that most Americans today live much better than the absolute richest American a century ago. He asks how much money would be required in order for you to prefer living in 1916 than in 2016 with your current income. I don’t think I’d be willing for any sum of money. While I’m sure being rich in 1916 has its benefits, I’ll take my computer and airplanes any day. I’ll deal with this apparent gap between labor compensation and productivity soon in a later post, but for now just take my word for it that it’s not exactly what it seems. Another important point is that anybody born in the US (or any other first world country), has already won life’s most important lottery. Eliminating poverty in developing countries is a much more pressing issue. 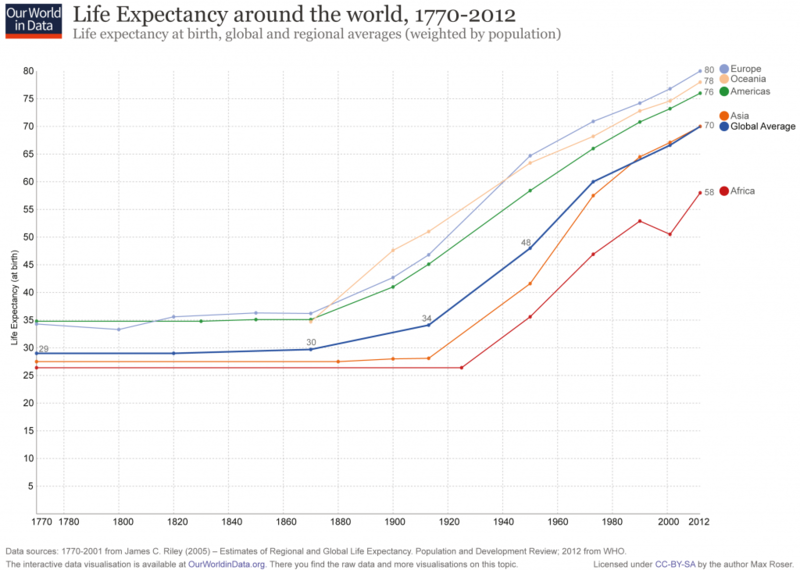 Here is what has happened to global poverty over the last 200 years. Since 1970, around the time when many would tell you the neoliberal agenda sent the world into a spiral of misery, the number of people living in extreme poverty has fallen from around 2.2 million to 700 thousand. These are of course not the only factors that matter. The rise in healthcare spending (both public and private) in the US and other countries is concerning and we will need to figure out ways to deal with this issue, but once again, the trend seems to be going the right way. You might say that I’ve cherry picked statistics to fit my story. That’s true. There’s a lot of bad things happening in the world right now. But we hear about those all the time. I think it’s important to also appreciate the stuff that is working and I do believe that the vast majority of people are far better off now than they have been at any point in the past. 1. Life expectancy graph is not shown (I just have a frame). 2. I think “2016 is the worst ever” you hear about comes from US mostly, while stats like world poverty probably do not concern average American. First graph in inequality section you show DOES concern average American, but you’ve teased about explanation later. 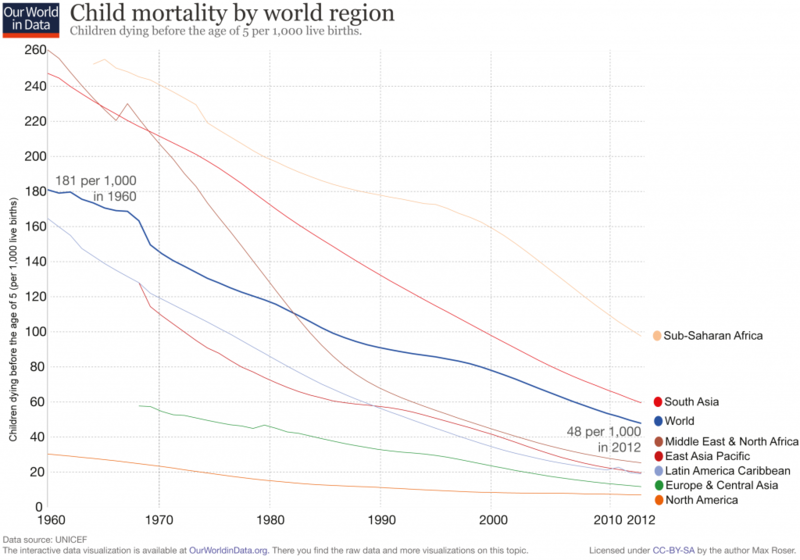 Child mortality in Sub-Saharan Africa is reported neither on Fox nor on MSNBC as well. 3. It seems to me, a great deal of concern with issues you’ve picked comes not from their intensity, but from their recently enhanced visibility. During crime peak in US in ’70-00s no way somehing graphic like recent murders BLM is protesting would be constantly on TV. In my personal view, social networks are the single most important factor in increased levels of perceived inequality (as well as actual mental problems). 4. Besides visibility, the level of discussion of the issues has also changed. Compare coverage of Bush-Dukakis debate with Obama-Romney, and realize that while arguably national problems in ’88 were far more severe, level of hysteria in ’12 is just unbelievable. When every day is covered a fight for our very existence as we know it, of course people would think 2016 is unprecedented in adversity. 5. Finally, many people perceive their misfortune relatively and not absolutely (in contrats with your graphs). Poverty in US today is having a home full of appliances and maybe a car, not dying on the street. Same with health – it is about health bills in 60s, not dying from fever at age 4. Graph should be fixed now. I agree that the main difference in the last few years has been increased visibility through social networks and media coverage. My point is that this increased visibility hasn’t corresponded to an increase in real problems. People should try to take a step back. Thinking relatively is fine, but compare yourself also across time and across countries and it’s not so bad anymore.